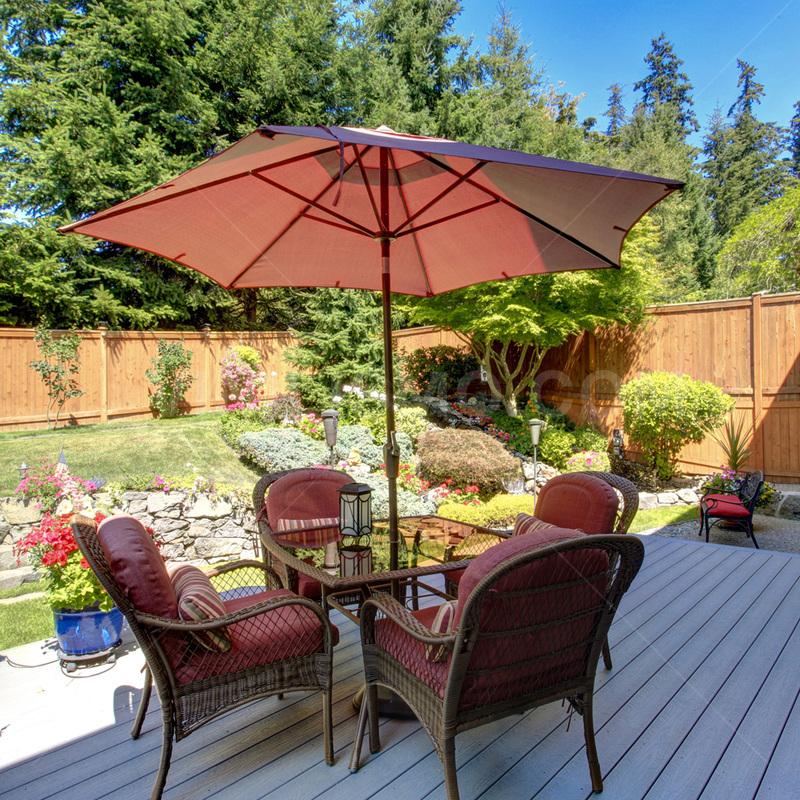 Can you imagine starting your day with a cup of coffee and reading the newspaper on your garden or backyard while enjoying the flowers and trees? 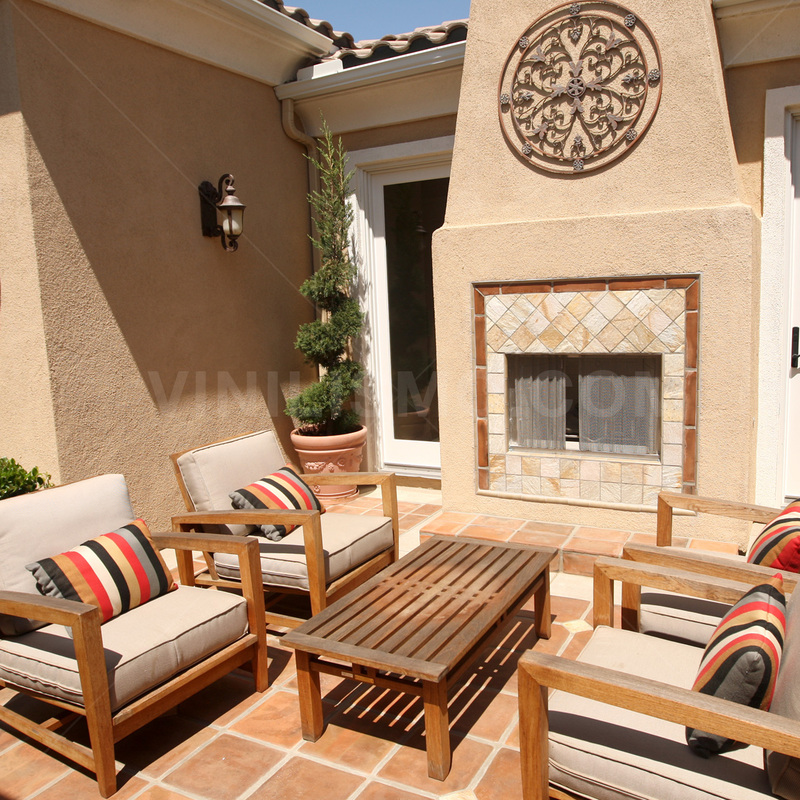 While outdoor decor is charming and wonderful results activity, not everyone has the clarity and patience to do. So our idea from Vinilismo.com is not just being a store of wall decals for interior but also give you all the tools to help you decorate your yard or garden. Before you begin, you should know that this activity requires a little work, not only for proper decoration but also to maintain it thereafter. Trees, flowers and furniture that have to be maintained on a regular basis. If you are willing to make this effort, then read on. 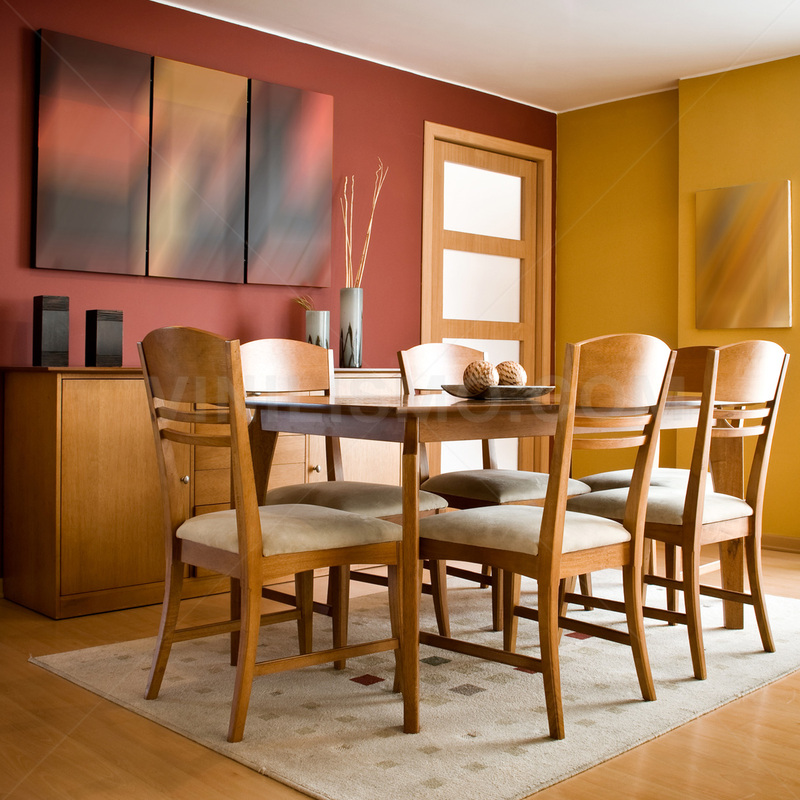 Beginning with the furniture, the key is not what kind of furniture going to place (tables, chairs, etc.) but that they are resistant to all weather conditions, regardless of the style you choose. So to avoid having a heavy workload, we recommend you to choose furniture that require little or no maintenance. 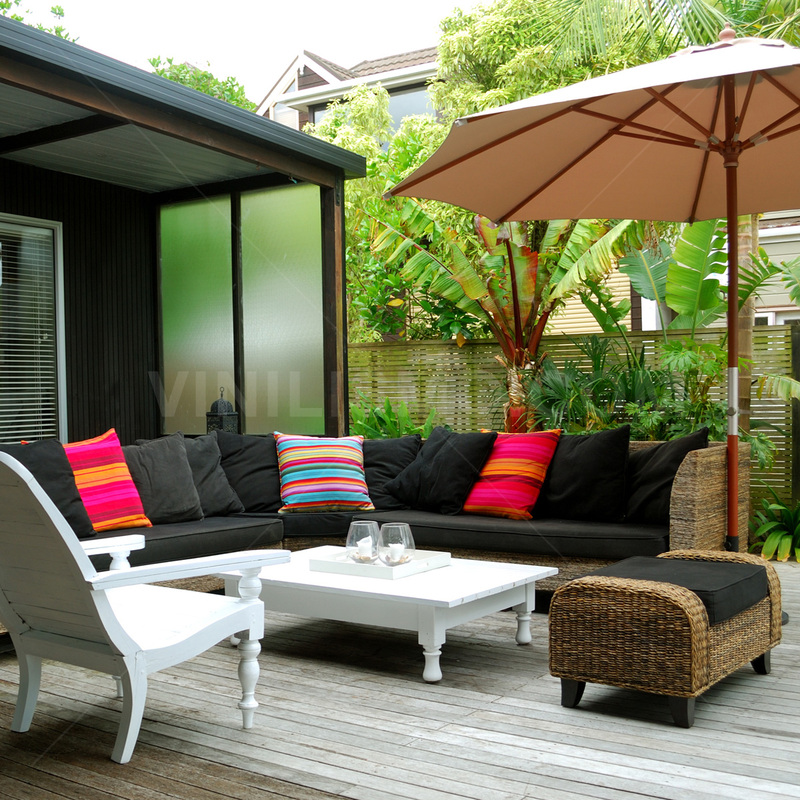 Speaking of materials, the most commonly used are wood, plastic, wicker and wrought iron. If you live in a region where the rains are very common, you should take caution if you choose wooden furniture, so that they are not exposed outdoors because the water can ruin them. Nonetheless, there are some that are waterproof, but are obviously more expensive than traditional ones. Meanwhile, if you prefer a more elegant and enduring style, the option we recommend is to opt for wrought iron furniture, but keep in mind that can rust over time. In turn, the chairs can be a bit uncomfortable if not complement it with a good cushion to enhance the comfort level. Table and Chairs: The table size will depend directly from outer space you have. For this you must take good measures in order to avoid overloading the space and losing comfort. In regard to color, you are free to choose the one you like best. Regarding chairs, as we mentioned earlier, if you choose wrought iron chairs, we suggest you supplement them with soft cushions. Although we should not leave out the choices rocking chairs, looking for a more relaxed atmosphere. Parasol: Especially for times of high temperatures, it is recommended that you install an umbrella to protect you from the sun, so you can get a cool retreat especially in hot and heavy days. When choosing an umbrella, seeks choose one that has a colorful and cheerful look. You will see that enhances the beauty of your yard or garden. 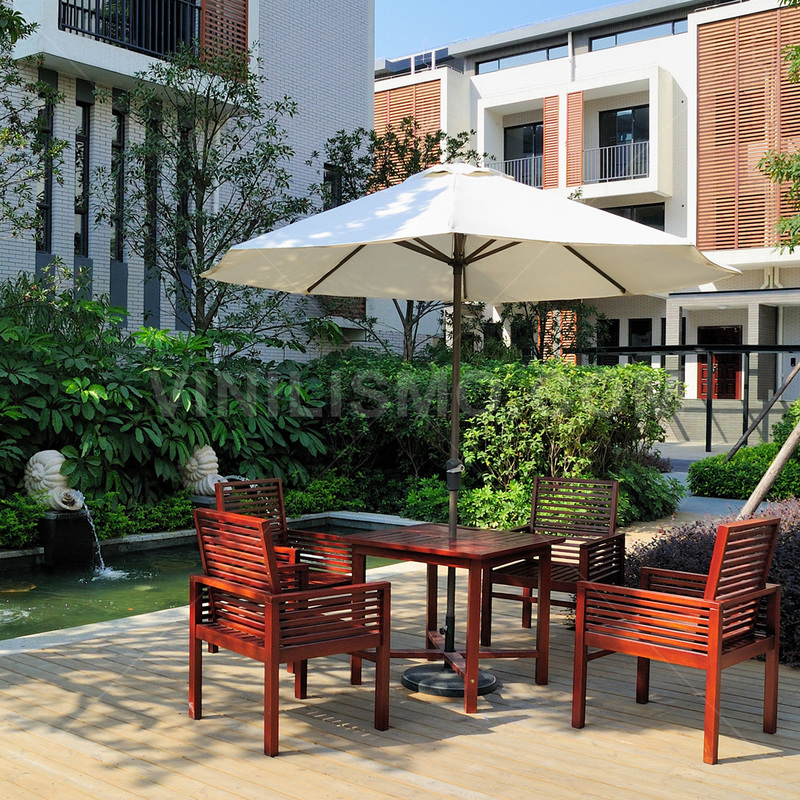 Decorative Accessories: Both the table and chairs and parasol are basics you should have in your yard or garden. But if you want to decorate it in a nicer way you can try adding exterior lamps, fountains or waterfalls miniature vases, plants and maybe some aviary. 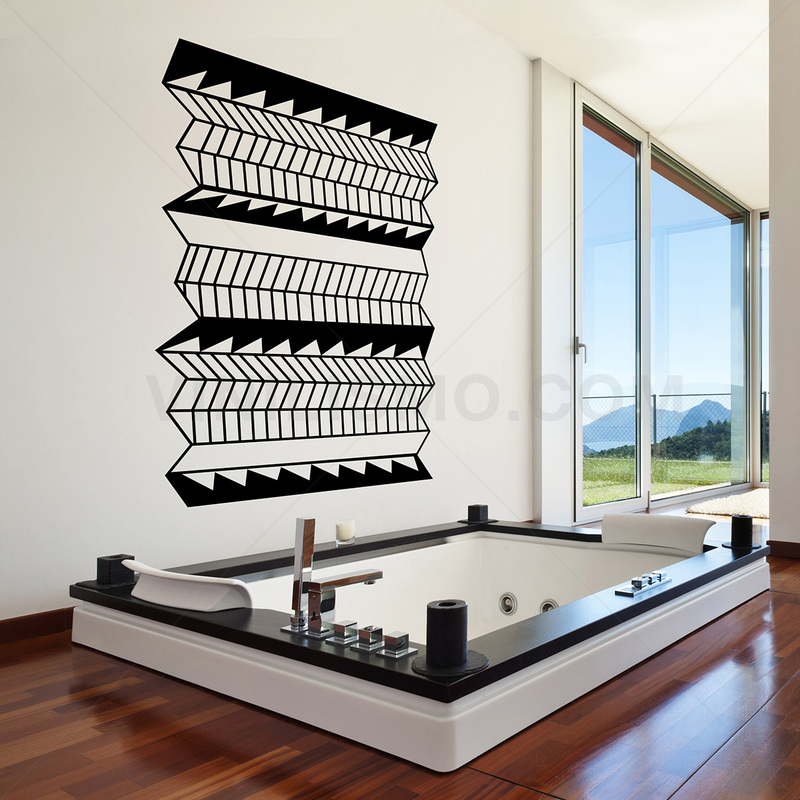 Finally, we remind from Vinilismo.com, wall decal store specializing in solutions for indoor and outdoor decoration, have in mind that like any internal environment of the house, furniture must avoid overloading the space you want to decorate for achieve greater wellness. This entry was posted in Interior Decoration on February 27, 2015 by Vinilismo. When choosing the right type of flooring for your home, there are a number of factors that you should be considered. To mention some of them, we can cite: the size of the rooms, the existence of pets in the household, the number of people who live, lighting that comes from the windows, as well as the type of decoration we have (wallpaper, murals, wall decals, etc.) For all this, you may see yourself overwhelmed due to the large number of options available. Therefore, in this article we will discuss the most important alternatives to help you to choose the best floor for your home. Some years ago, vinyl was a type of floor very chosen given its durability and cost quite economical. However, over the years the world of decoration evolved and to new alternatives decorating with vinyl came to be used in walls and no longer exclusively on floors. Among these new alternative flooring types we mentioned, we can find laminate and floating wood, carpet, stone, among others. 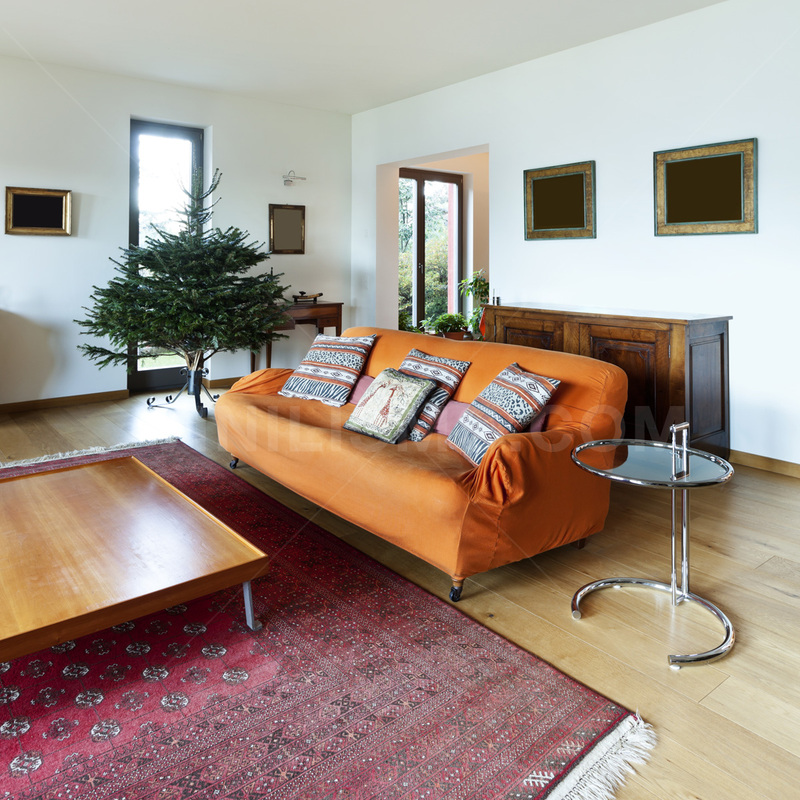 Floating floors are ideal for those seeking similar to wood floors but at a lower price. The main advantage of this kind of flooring is that it is very easy to install, can be easily cleaned and not damaged by water spillage. Under this latter quality is that many people take into consideration for installation at critical places with another kind of soil. For its part, the wood floors have been for many years the favorite for many people, not only for its aesthetic appeal but also because they have a high adaptability to any decor you choose in the environment. 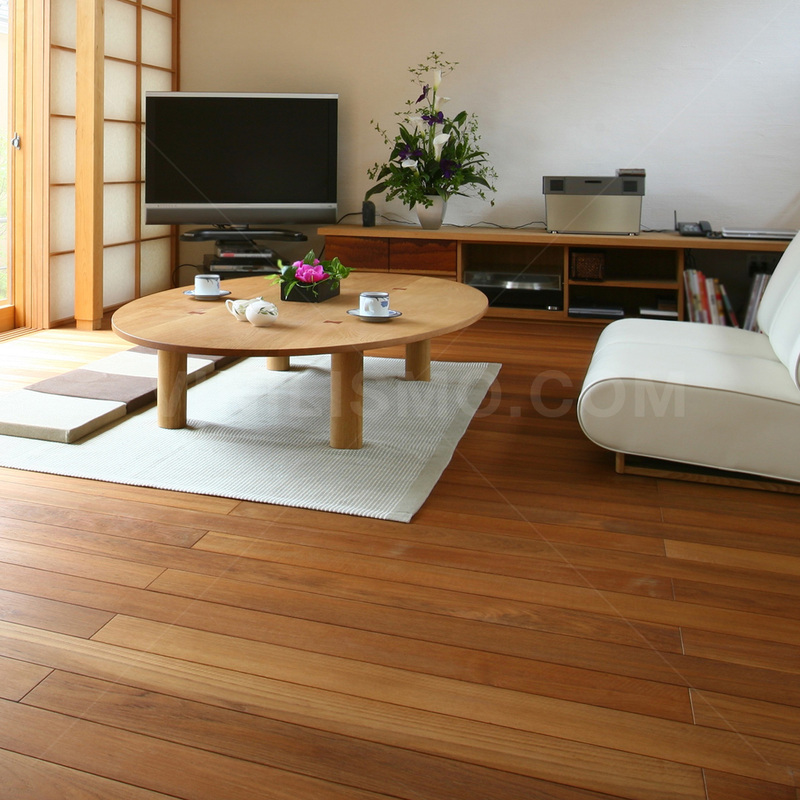 The only disadvantage we can mention is that require care and maintenance to last as long as other types of flooring. A major disadvantage of carpet is accumulating dust and therefore requires constant cleaning and maintenance. Besides, this kind of soil is not ideal for homes where are people who suffer from allergies or toddlers. If that were the case, we recommend you to choose a wooden floor or failing a floating or laminate. And finally, another type of flooring option presented is the stone. Within this range you can choose from marble, granite, ceramic or tile for example. The key is that this type of flooring is durable and requires little maintenance but is usually somewhat costly. Decorate your home and especially decorating with vinyl is an excellent complement to any kind of soil. You come to visit our store at Vinilismo.com to find the option you like best and suits your needs. This entry was posted in Interior Decoration on February 26, 2015 by Vinilismo. How to decorate the baby's room? In moments of sweet expected, a topic that excites and motivates parents is how to decorate the room of your future child. Anxiety makes parents are willing to do everything possible to give the best welcome to the newborn baby. Some choose to paint the walls in light colors, others to install wallpaper or wall decals as well, there are those more traditional parents who are inclined decorative objects rather than decorate the walls. For this reason, the purpose of this article will be able to help you have the best decorating your baby deserves telling the most important aspects that have to be considered. The objective is abundantly clear: Provide form a warm, friendly and comfortable environment for your baby. Let's start with the color of the bedroom. Usually, the most popular colors are those of soft colors such as beige, blue or pink. In this regard, you should avoid decorating the room with colors too strong. The reason is simple. Being so small, have not yet developed senses completely and is highly likely to feel upset and over-stimulated if they perceive a strong color, which will prevent them relax and fall asleep. For this reason, often used the light blue for boys and light pink for girls. Following bedroom decor, many parents choose to place kids wall decals. This kind of vinyl, besides being very easy to install and remove, will provide the environment a fun image that having a smooth wall painted a single color. Another point to consider is the level of ventilation that will have the room. Babies are very sensitive about everything that happens around them, which should pay close attention to ventilation bedroom to prevent it affects the health of your baby. In this context, you should not place the baby playpen near to the window avoiding the baby gets sick. The third thing to consider is lighting. Like wall decor should be soft and comfortable, through a clear light that prevents the baby can dazzle and uncomfortable. At night, it is recommended that the lighting be softer than during the day to allow relaxation of the baby and can fall asleep harmoniously. In regard to the bedding, both the sheets, like pillows, blankets, bedspreads, etc. is ideal that match the decor of the room. If for example, you have chosen kids wall decals with animals, you can buy bedding with puppies or kittens that match the wall. A tip that you should never forget, is to wash the bedding once a week to maintain the cleanliness of the room. Finally, when buying a playpen and bassinet, the safety aspect is the priority that both elements must be met. The playpen should be sturdy and strong enough for the baby to sleep as well as daytime play. In turn, must be lined with a soft pad to prevent the baby from being hurt if he hits accidentally. We hope these tips be useful and you can decorate your baby's room comfortable. 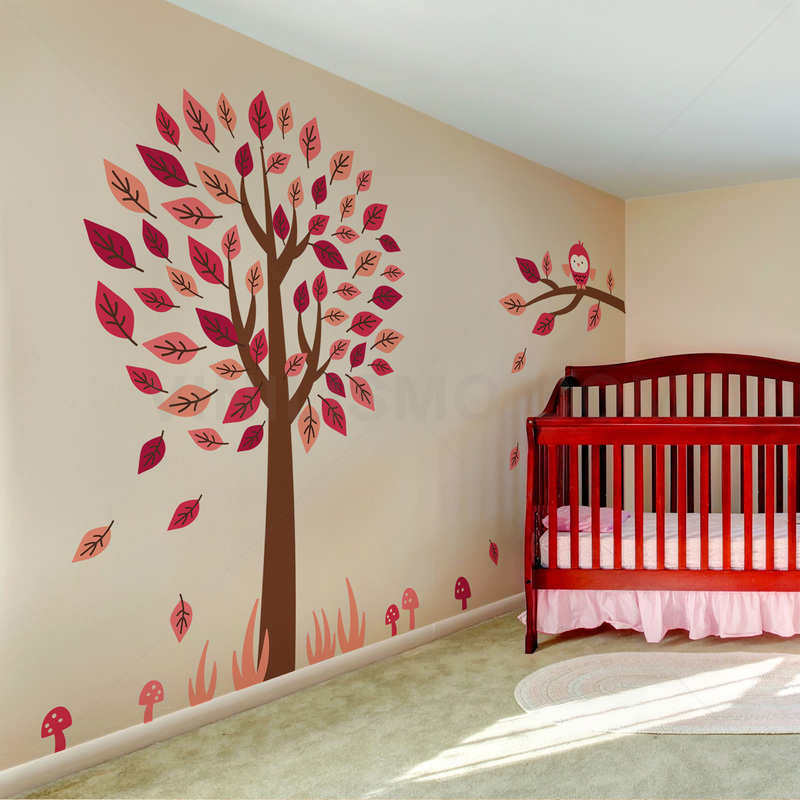 In Vinilismo.com will be willing to help you and advise you on the best styles of decoration for your baby. This entry was posted in Interior Decoration, Wall Decals on February 20, 2015 by Vinilismo. 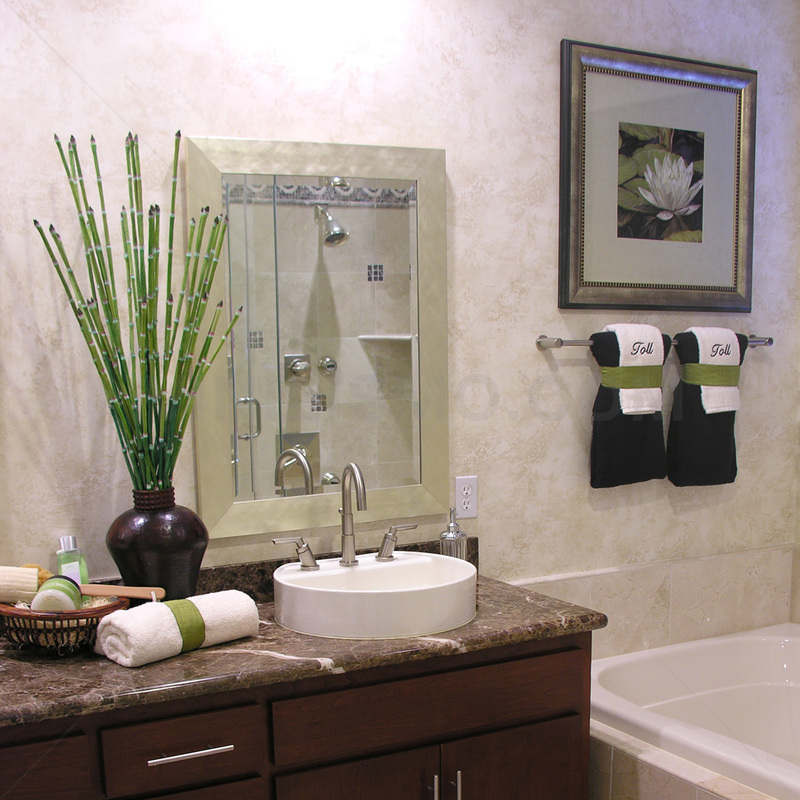 The bathroom is a very important place to start adding value to your home. The priority of this article will introduce ideas about what items you can incorporate into your bathroom, for example some wall decals to transform the look and feel of that environment creatively and give your own personality. One of the first things to consider is the color scheme you have in your bathroom. This is because depending on how you decorate the walls, this will have a direct influence on the color of objects you choose. For example, you can decorate the bathroom in a different way with wall decals of any particular design to bring you a different perspective. 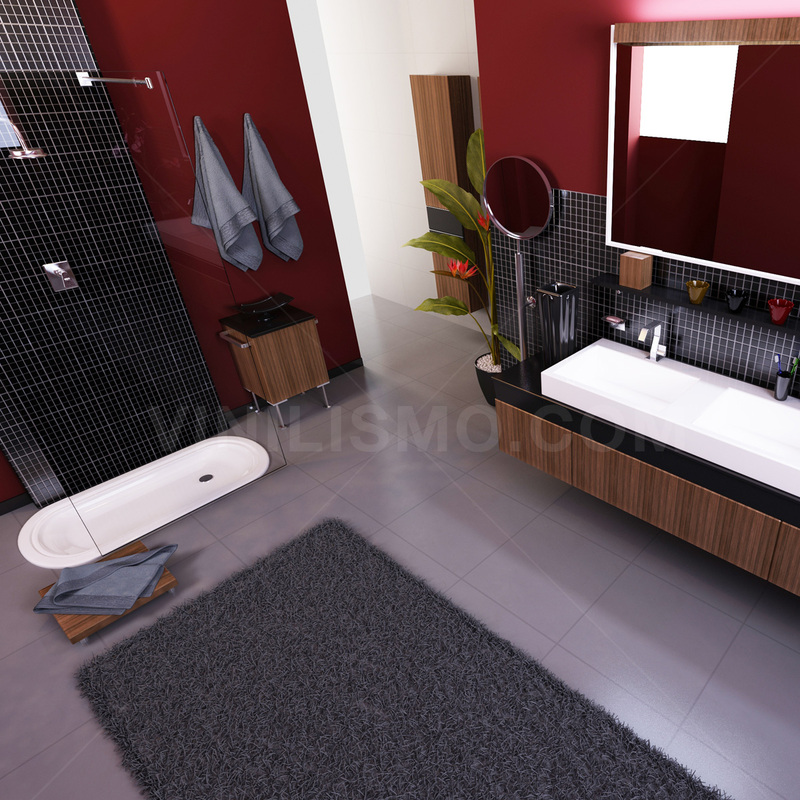 The color of bathroom accessories or objects may also influence the style you want to provide. As an example, collocate a shower curtain, towels and rugs green with silver accessories achieve a harmonious combination with sink, toilet and even the tiles that are usually white. Meanwhile, if you want a slightly more glamorous and modern style can go to purple with white trim, or a grayish hue to provide a classic and sophisticated look. If you have a vanity cabinet with doors and drawers, a good idea is to buy fabric lined baskets where you can store items neatly and store them inside the cabinet. Similarly, with regard to the drawers you can buy trays with compartments for storing different things like makeup, orderly manner. In turn, in bathrooms that have a sort of counter (usually white), you can add some decorative elements that give more style to the environment. In this context, if you have perfume on the counter, it is advisable to place them above a mirrored tray. And since we mention trays, you can also buy some special decoration and place rolled towels. You will see how these two changes will achieve a different bathroom. At the same time, you can buy decorative boxes (gray with white trim is an elegant combination) that allow you to save makeup, brushes, etc. Also, it is a good idea to buy some bottles for storing sponges, bath salts and soaps, which when not in use will add a decorative attractive touch to the bathroom. 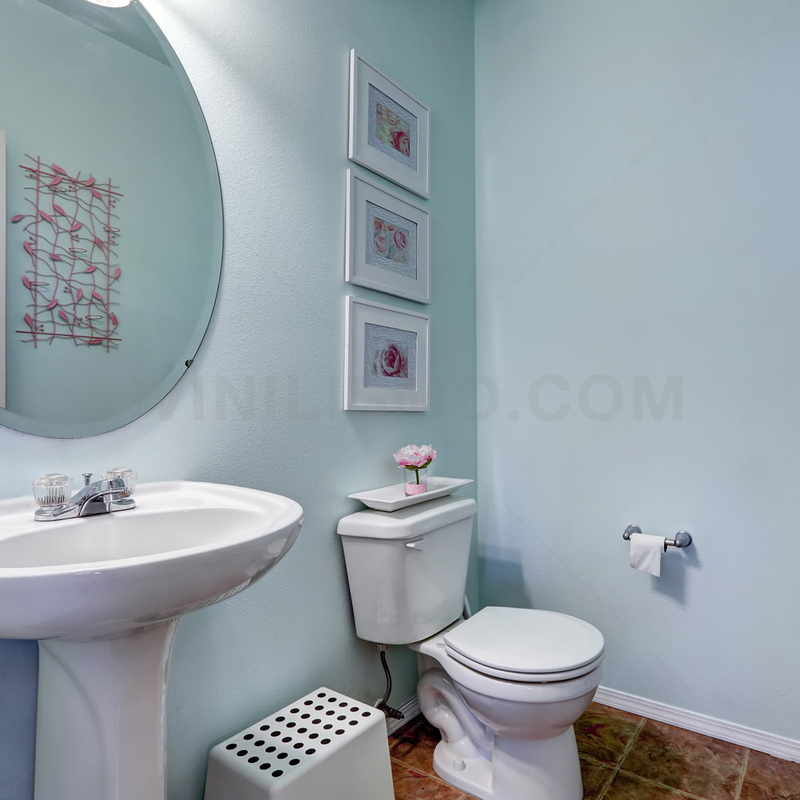 If you have a small bathroom, ideally optimize spaces and for this, you can place a basket in black in front of the toilet to store, for example, rolls of toilet paper. A ledge of the same color can place it at half height above the toilet to put decorative items like candles or ornaments. Finally, if you are a person who likes creativity and originality, you can put wall decals on the toilet or in the sink with some funny figure or even a picture of a place that interests you. In Vinilismo.com we can satisfy your expectations because we have custom designs. 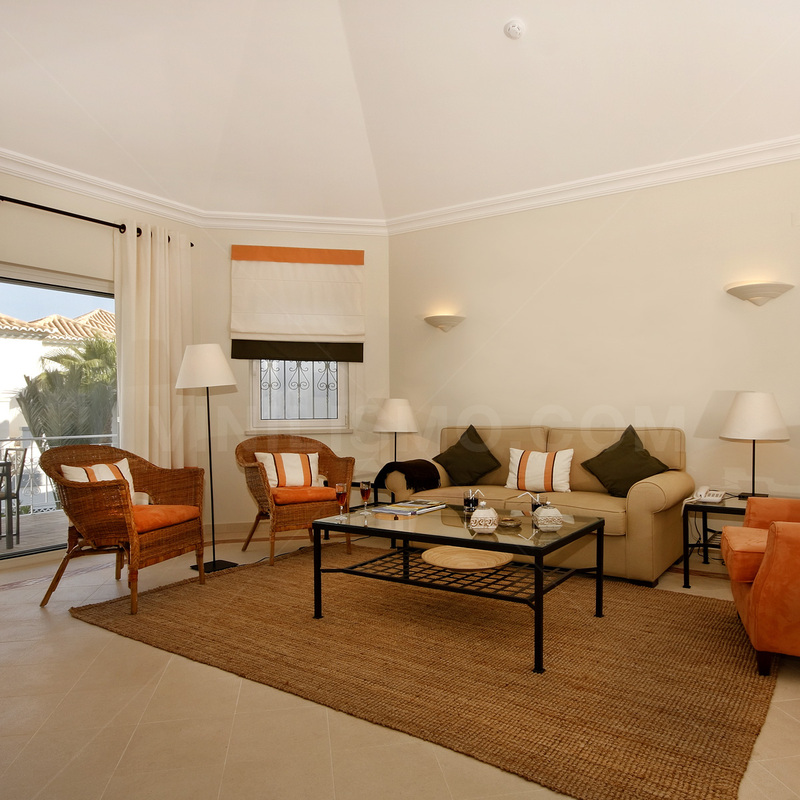 Therefore, we invite you to visit us and let us know your concerns of decoration to advise you the right way. This entry was posted in Interior Decoration, Wall Decals on February 19, 2015 by Vinilismo. What objects must acquire to get a minimalist decor? If you have an apartment or small house and are trying to find the right look to decorate, we suggest you lean for a minimalist style. The essence of this style is basically that "less is more". If we were to define it broadly, it can be said that the minimalist decor is one that is characterized by simple, optimizing the little space that you own, or in terms of design, the predominance of soft colors (especially decorating walls), thus giving a modern style without being boring. a) Amplitude of spaces, so it is important to have the least amount of objects. b) Order, one of the basic premises in order to achieve balance and harmony in the environment. 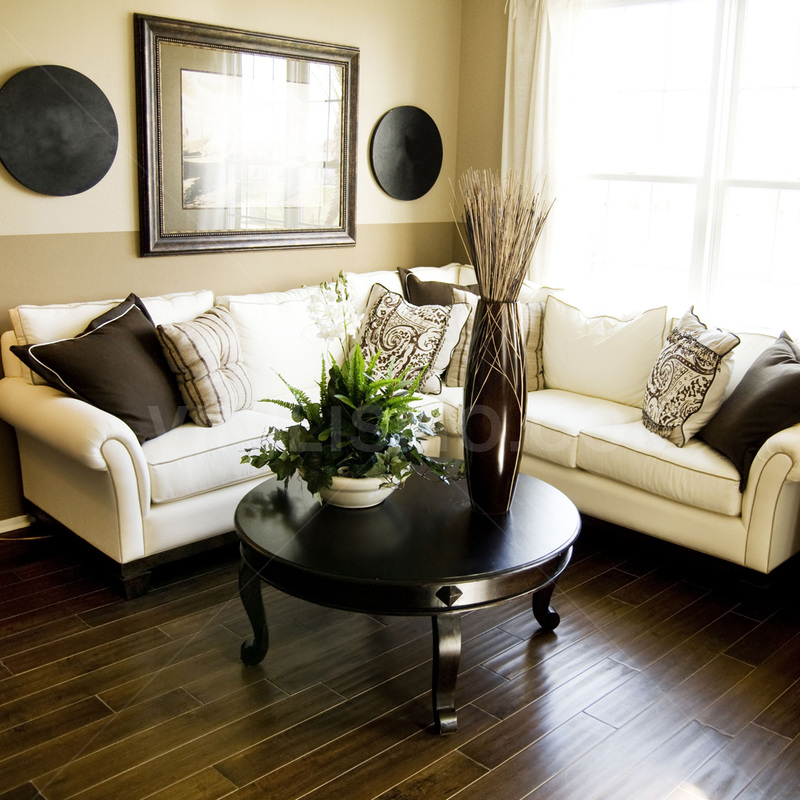 c) Neutral colors, such as white, black or gray are best used especially decorating walls. d) Minimalist furniture, characterized by being simple, multifunctional and especially straight. Depending on the type of environment we want to decorate, they can vary the amount of objects to get this particular style. If you are decorating a room, just enough to have a couch, two chairs minimalist style (neutral color) and a coffee table (with a vase of flowers ornament). Should have a little more space you can add a TV as well as a pair of lamps to help design. Finally, to take advantage of airspace can put some pictures or artwork. But if we want to decorate a room with a bed, a wardrobe and a bedside table are sufficient. A further added, can be a bookcase to be hanging on the wall to get more floor space as well as a small potted plant. With regard to the bed, which are minimal beds are characterized by having an elegant and aesthetic connected to the oriental more, which ends reflecting for example, in the design of the bed frames. Finally, in line with the similarity of oriental style, there are particular options that are specific to the minimalist style, such as rolling mattresses, allowing an open feeling of the environment by having the mattress on the floor and feel the roof is a little further away. 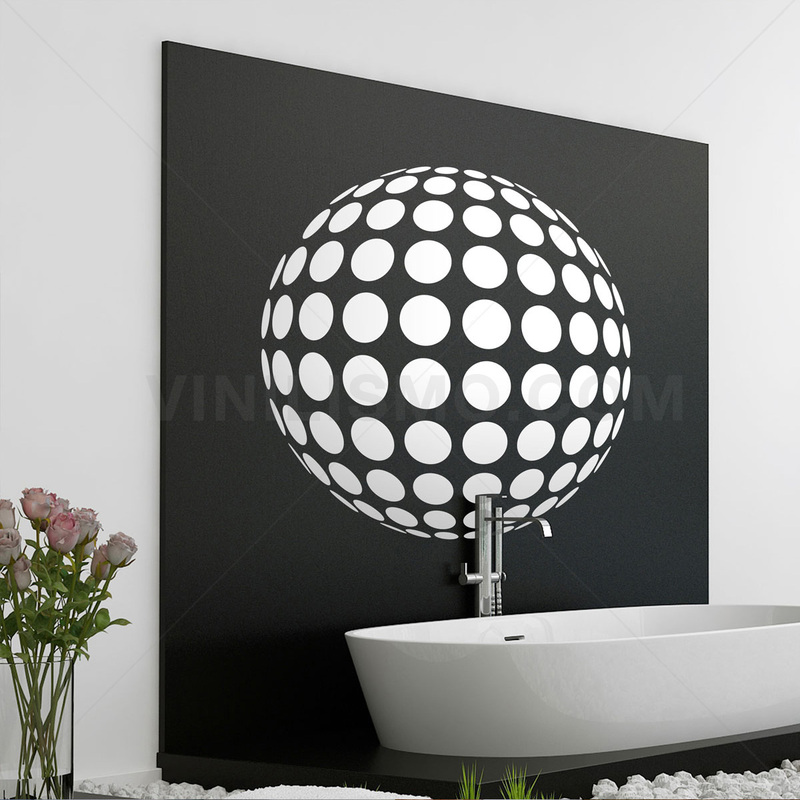 Finally, we can also give a minimalist style to the bathroom. To begin, you should hide only the items that are used in daily routine and the rest can be stored in a box inside your closet. In turn, the key to achieving a minimalist look is to keep these hidden elements often used either in a drawer, behind a mirror or located within an organizer. Decorating walls in the bathroom should be clear tone to give the impression that the space is broader than the actual and towels undoubtedly color from white to blend in. Finally, a good suggestion to complement all this is to change the taps by others according to the design and shower curtain for a door acrylic (or failing a transparent curtain). As you may have noticed, the minimalist decor ultimately seeks to preserve the design of the house on the highest level of simplicity, order and neatness as possible, is for this reason that the minimalist style can go in excellent harmony with some wall decals. This entry was posted in Interior Decoration on February 13, 2015 by Vinilismo. What type of carpet should I choose? 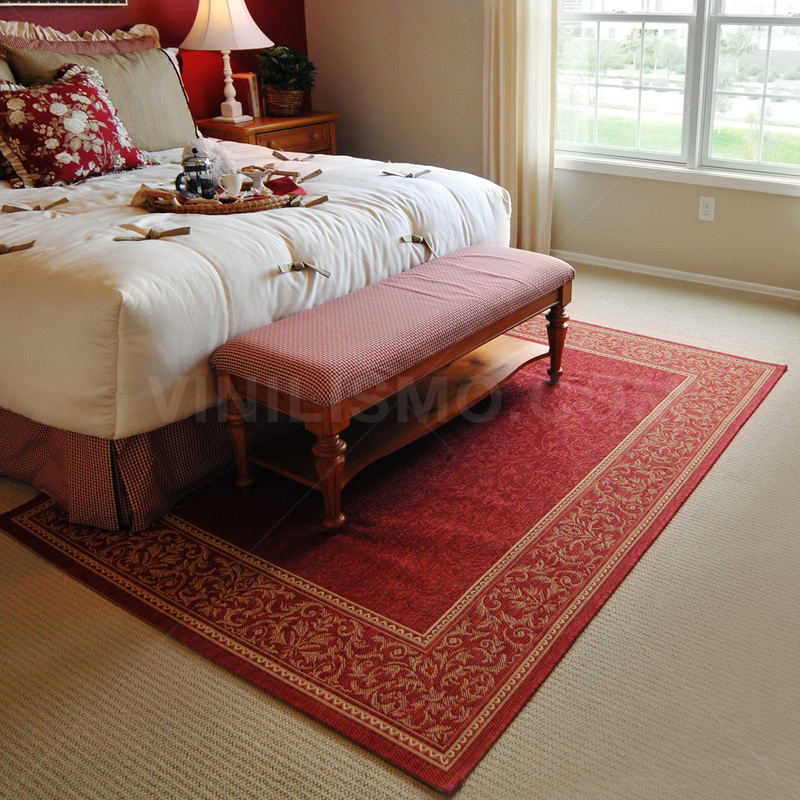 The type of carpet to use is one of the most critical elements when it comes to home decor. Many people prefer those extending from wall to wall, while others find it more attractive to use smaller rugs covering certain areas of the floor alone and combined with wall decor (either wallpaper borders, wall decals or wallpaper as appropriate). The correct decision on what type of carpet you choose not only brings more warmth to the atmosphere but also will transform it into a more beautiful and elegant. For this reason, in this article we propose to help you choose the most suitable type of carpet for your home and so we hope that the following tips are taken into account, according to your own tastes. The first factor to consider is the texture of the carpet. Some are made of wool and other synthetic. The former are likely to be longer, but when the choice is essential to weigh all the factors that tip the balance from one side to the other. Under this, the budget and the level of elegance you're looking for are clues to determine what style, design and carpet model will be to your liking. In regards to durability and quality wool carpets are recommended to be more resistant and also very easy to clean but they are also the most expensive, so it is important that you evaluate very well what is the budget that accounts and what use you'll give to the carpet to decide whether it will be worth you purchase a rug in wool or synthetic. However, if the idea is to decorate a bathroom, a kitchen or basement, probably not worthwhile to invest much money in a wool rug, but a synthetic would be your ideal choice. Another consideration in choosing your carpet is the color. The same will depend largely on the design and style that have given to the room you want carpeting. For example, we say that if you have a room with light walls, we recommend that you focus on a carpet with a bright color that allows highlight and vice versa. A very modern and stylish combination is, for example, decorate your kitchen with a light colored wallpaper borders and place a dark carpet for a good contrast. Finally, the last thing to consider is installing carpet. If you are a person who has manual skills and want to encourage you to place it, go ahead! Sometimes it may be convenient to call a specialist to do the job for some extra money. And with regard to the part of the decor, in Vinilismo.com can help and advise you on what type of decoration would be most appropriate for you, such as wall decals, wallpaper borders or other decorative element to your liking to match your carpet. You’ll notice, it all adds up and it is important to consider all these aspects before buying your carpet. This entry was posted in Interior Decoration on February 11, 2015 by Vinilismo. The world of decoration is so broad that it can find many tips to transform your home into a warm, cozy and comfortable place. The trend today as far as decor is concerned, is that it is decorated with the intention of leaving impregnated footprint of each of us, with the sole purpose of which will be our style. However, this article will not discuss decorating a room in the house but a modern, original and fun way to decorate your home appliances. Yes, as you read: Your appliances. It is known that the appliances are an essential part, for example in the kitchen, so if you're tired of seeing the same color always and you want to change them a little bit the design, this article will be very useful. Specifically, we are referring to an alternative so fashionable today, as economic such as wall decals. This type of decoration is often very common to use it to decorate walls, floors, ceilings in some cases, but as trends evolve, the market now offers the ability to "change their face" to your appliances, making them more modern and fun. One of the main advantages of vinyl is that beyond being the cheapest form of decoration that is sold today and is an easy option to clean and use since its installation and removal are very simple, to the point that even you can install it and thus make your kitchen has a modern, fun and different air. In regard to styles and designs, there are many options currently available. You can choose between those with some special reason, just as those with cheerful stripes or geometric figures. For example, Vinilismo.com is the shop specializing in this area , where you will find plenty of models. 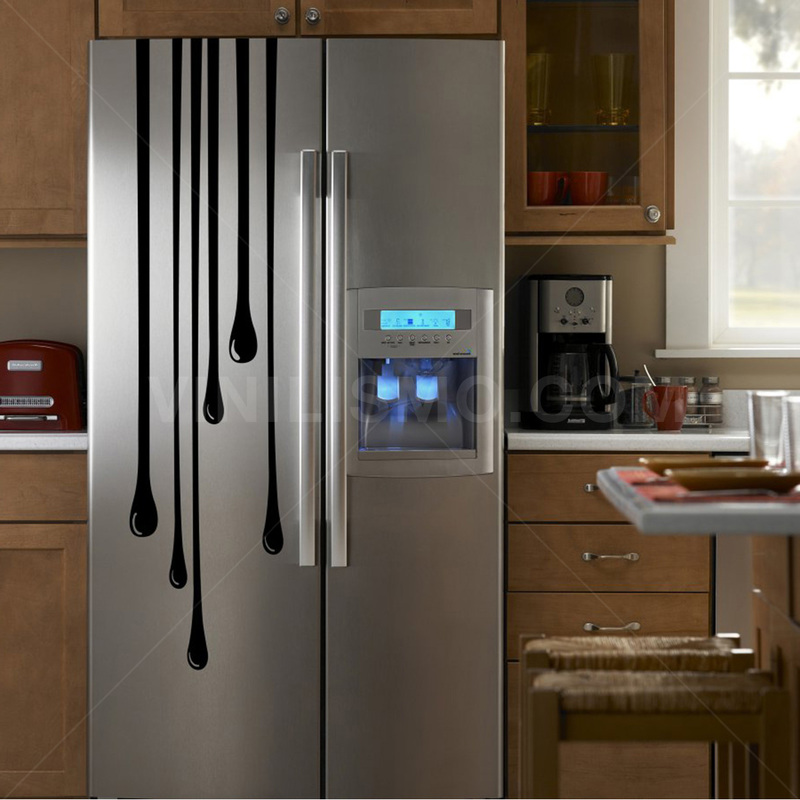 Even if none convince you, you can request your own custom vinyl so give greater identity to your appliances. In general, we can give you a few guidelines you have in mind depending on what you fumble for. In this sense, a vinyl presence of orange is ideal for young people. Meanwhile, those that are green are ideal for transmitting an image of tranquility, harmony and freshness. Can you imagine your fridge decorated green? It is a matter of trying, dont’ you think? 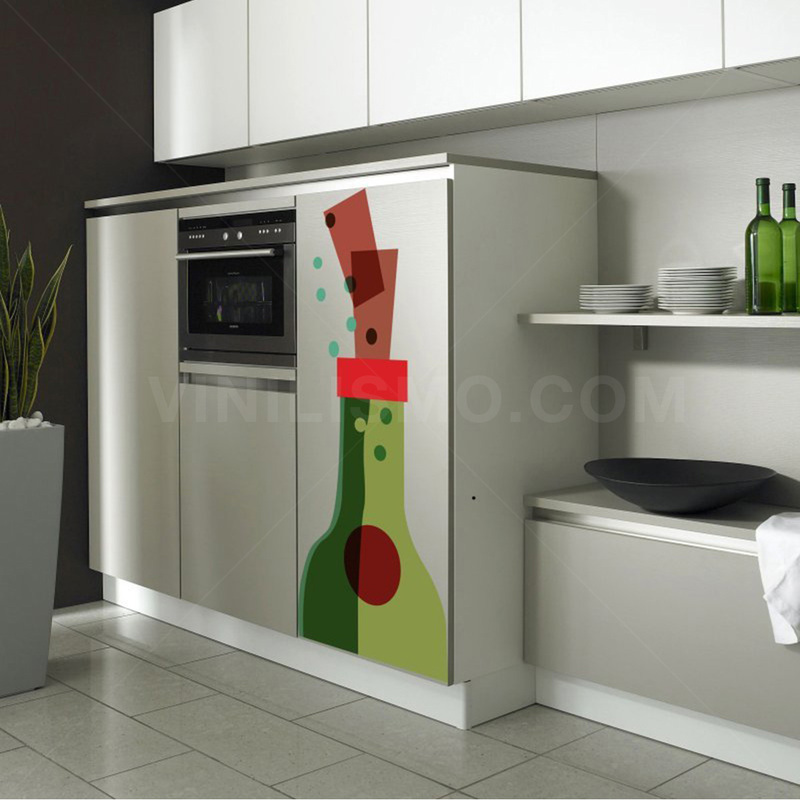 That is why in Vinilismo.com you can find wall decals with custom designed for each appliance (striking patterns or shapes with colors that stand out) or you can order any you like and do it to the extent that you require. Only a matter of letting your imagination and see which option is best suited to your tastes. As a last advice or recommendation, to choosing your stickers for your appliances, try that they are harmonious with the rest of the decor of your kitchen, for example, the walls. This way, you get keep everything in sync and combined. This entry was posted in Interior Decoration on February 6, 2015 by Vinilismo. When decorating a home, we must make a clear distinction between what would be a decoration for an apartment and what would work for a larger space if we have to decorate a house. The fact of having fewer square meters not mean we can not give the rooms a warmth and a special tone that allows live comfortably. Starting with the decor departments, the main point is decorating walls with light colors because they generate the effect of having a light and airy atmosphere, something that perhaps in a house can be overlooked. The second factor to consider extremely important is the size and value of the furniture you choose. In a house, certainly space is not something of worry. For example, while in the house we have a comfortable sofa and a bed in the room in an apartment (especially in mono- environments) the idea of ​​buying a sofa that fulfills both functions when needed, appears as a very interesting alternative to optimize space and cost savings. Regarding the remaining furniture, it is important not populate the environment but use those that are functional taking care not to place them in locations that interfere step. These are key points described to decorate the living room of the apartment. 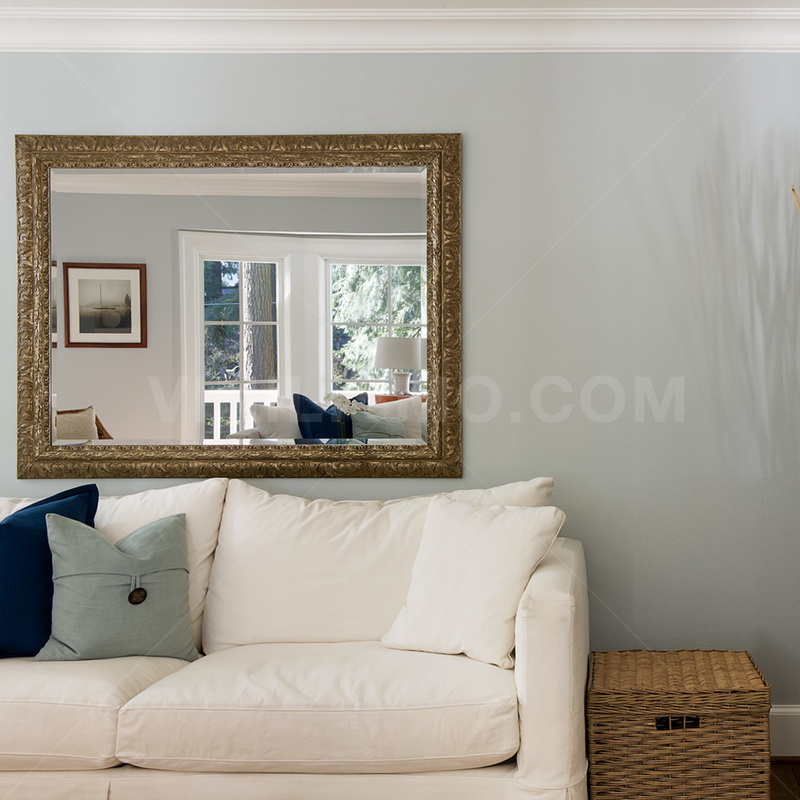 What we must not forget is the importance of placing a mirror as optical favor of having a much larger space. And it should be noted that in case of having more than one environment, these same tips apply for the rooms individually. Meanwhile, with regard to the decor of a house may have certain similarities and differences to decorate a department. For example, in regards to decorating walls if you want to highlight the environment and make extensive use neutral colors would be interesting. If, however, have clear furniture, paint a wall of dark colors can provide excellent contrast. 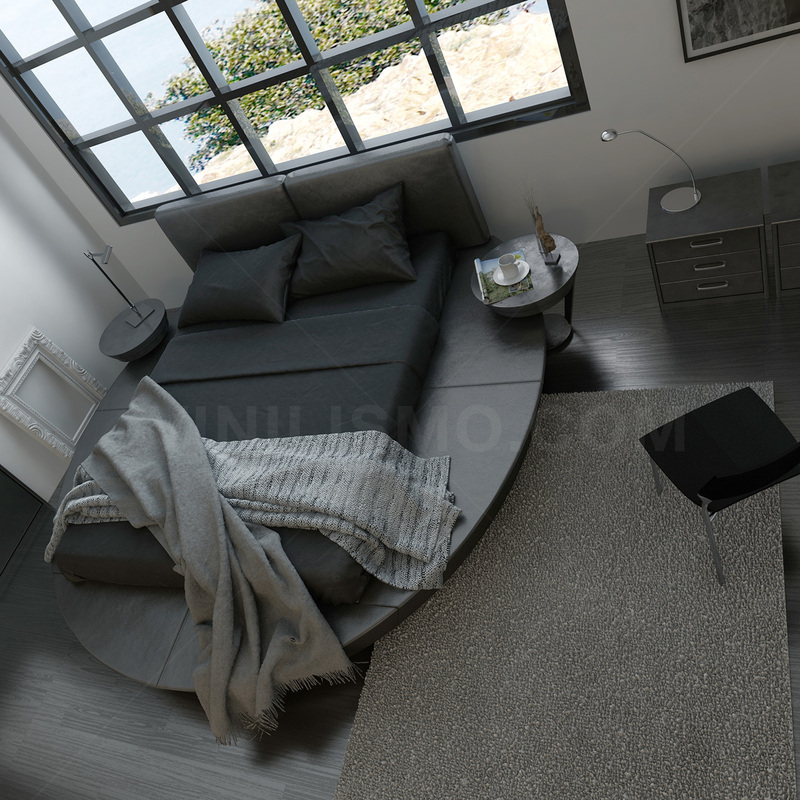 Regarding the furniture, the big difference is that the apartment naturally has a larger space, but that doesn’t mean that the same precautions are not taken looking optimization and functionality thereof. 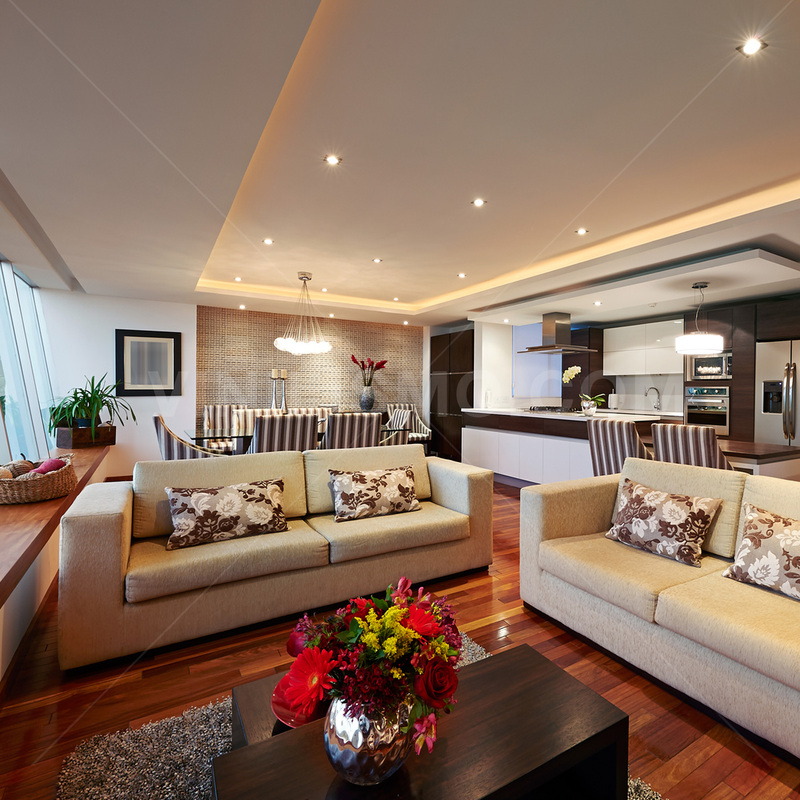 This is how a living room full of furniture, is able to reduce significantly the space which when compared with which space was optimized department is greatly note the difference between the environments. On the other hand, have more space allows us to choose furniture of different styles whose combination proves harmonious and pleasant. For this reason, as we said at the beginning it is essential that when decorating one option or another, first do a proper evaluation and planning of available space. There is no magic formula for decoration. Everything happens for the personal taste of each. So go ahead and decorate your apartment or house giving you your own identity to your home. The advantage of having housing options either house or apartment, is that both can be decorate with wall decals. This entry was posted in Interior Decoration on February 5, 2015 by Vinilismo.